Dow Jones Industrial Average News, 5/23/2016: Earnings season is winding down, and traders are keeping monetary policy in focus. Pay attention to a busy week of Fedspeak as investors turn their attentions to the possibility of an interest rate hike by the U.S. Federal Reserve in June. After last week's significant shift in expectations for the June FOMC meeting, we'll be listening for monetary policy opinion from three members of the central bank today. Prepare for Fed-driven volatility in the weeks ahead. Here's today's top stock market news, stocks to watch, ways to profit, and economic calendar for Monday, May 23, 2016. Futures for the Dow Jones Industrial Average were up a meager seven points as investors take a wait-and-see approach to the upcoming monetary policy decision by the Federal Reserve. According to CME FedWatch, there is a 26% probability that the central bank will increase interest rates during the upcoming FOMC meeting on June 14. The odds tick to 53% for the July meeting. It's a light day of economic data as investors weigh overall sentiment from members of the Federal Reserve. That puts a number of other stories on the radar for investors. Biotech stocks will be in focus today as public health officials warn about a state-side outbreak of the Zika virus. The National Institute of Allergy and Infectious Diseases announced there are already more than 500 American cases of the disease. Warming summer months could lead to an outbreak, raising expectations for a big run for companies aiming to tackle the disease. Companies that have been working on potential cures and treatments include Zika stocks like Inovio Pharmaceuticals Inc. (Nasdaq: INO), Sanofi SA (NYSE ADR: SNY), and Intrexon Corp. (NYSE: XON). On the international front, Greece's parliament took emergency measures into their own hands by introducing a series of new taxes and spending cuts to ensure the nation will be able to obtain emergency funding. The nation's top creditors in the International Monetary Fund and Germany have been debating how to provide Greece with much-needed debt relief. WTI crude oil prices were sliding thanks to a stronger U.S. dollar and a failed unification among OPEC producers. Yesterday, Iran's key oil ministers said the nation has no plans to freeze crude production ahead of the upcoming OPEC meeting. Iran is trying to hike its production levels back to its output during the pre-sanction years. OPEC producers are set to meet on June 2 to discuss the cartel's global production target. Iran and Saudi Arabia remain deadlocked in proxy wars in hotspots across the Middle East, raising the stakes of next month's meeting. WTI prices were off 0.5%, while Brent crude slipped 0.3%. The dollar continues to rally as investors anticipate a rate hike as the summer approaches. Apple Inc. (Nasdaq: AAPL) is in focus as the tech giant's CEO visits India to meet with Prime Minister Modi. Although the company is struggling to boost market share in China, Apple's commitment to India could be a potential game changer for the firm. In fact, India is one of several major reasons why Money Morning Director of Tech & Venture Capital Michael A. Robinson sees its $95 share value today as one of the biggest bargains in the market. Be sure to read why you should own AAPL stock today. Bad news for international airplane maker Boeing Co. (NYSE: BA). The firm was sitting in the crosshairs of Barron's. The paper said in a weekend article Boeing's stock could fall as much as 15% should the firm experience ongoing sales weakness. A report by Reuters indicates Boeing's key customers – airlines and leasing firms – are using their airplanes longer and have been delaying orders over the last year. The decline in oil prices has also affected demand for more gas-efficient planes. Shares of Deere & Co. (NYSE: DE) were rebounding after a Friday to forget. The firm reported falling sales and profits in the wake of a decline in agricultural commodity prices. The heavy machine manufacturer said the global agriculture sector has slowed down; however, the firm said its focus on cost containment helped it overcome low expectations for the quarter. On the earnings front, look for reports from Nordson Corp. (Nasdaq: NDSN), Checkpoint Systems Inc. (NYSE: CKP), and CTC Media Inc. (Nasdaq: CTCM). 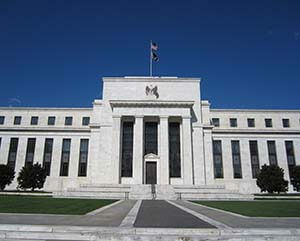 St. Louis Federal Reserve Bank President James Bullard speaks at 5:30 a.m.
San Francisco Federal Reserve Bank President John Williams speaks at 8 a.m.
Philadelphia Fed President Patrick Harker speaks at 6:30 p.m.